One of the commonly known failure points on the RV-10 is the extension that attaches the main wheel pants to the axle nut. Being the creative group that airplane builders are it didn't take long for a few options to appear including this one. Some of these solutions are available commercially such as this kit from Cleveland tools which lists for $50. I'm a long ways away from needing these but since I have Ben's lathe set up I decided to take advantage of it and turn my own. I spent $6 for the aluminum, and 6 hours of airplane time, to make my own version. Was it worth it? No doubt, not in the money saved ($44) but in what I learned about metal work and also the satisfaction of having made my own parts. There is still a bit of work left to be done on these (tapping the bolt holes for example) but overall I'm happy with how they turned out. I love these modifications! Here they are. 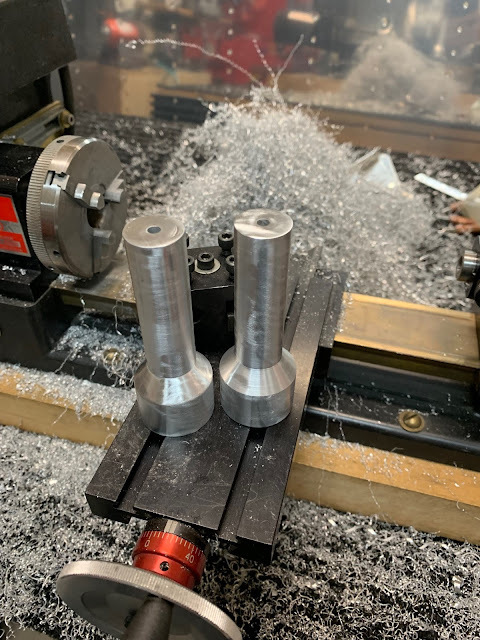 Two nicely turned extensions with a huge pile of aluminum shavings in the background.